A few months back, Knob Creek® and Gizmodo asked us to take part in a new program called The Knob Creek® Taste Experience. Knob Creek® and tasting things? We’re in. Don’t even worry about giving us the details. Just sign us up. We spent a few weeks hopping flights and sleeping in hotel rooms, all in the name of discovering the best eating and drinking this country has to offer. Let’s just say it was not the worst job ever (check out our trips to Dallas, San Francisco and Seattle for proof). As of today, we’re officially back at it and excited do some Knob Creek® Taste Experiencing in our own backyard. We decided to hit up a few of our favorite NYC spots, both old and new, to see how they make delicious eats and Knob Creek® drinks work together in harmony. Spoiler alert — they do it well. You may recognize chef/restaurateur Michael White from such world-class restaurants as Marea, Ai Fiori, and Osteria Morini. But did you know that he recently opened up a cocktail bar in Tribeca? The Butterfly is his homage to the supper clubs of his home state of Wisconsin, which honestly isn’t a concept we know much about. What we do know is that this place has a cool mid-century modern vibe and incredible cocktails courtesy of one of New York’s most well known mixologists, Eben Freeman. And while Freeman has curated a list of classic drinks from the American catalog, White has designed a menu of elevated but casual eats to accompany your drinking. It’s a nice situation for hanging out with friends and some laid-back eating — two things we’re very passionate about. High-end pork rinds with pecorino, cracked pepper, and rosemary. What’s not to like? These little croquettes are stuffed with corned beef and sauerkraut and come with a Thousand Island dipping situation on the side. They were a perfect salty complement to the sweetness of the Knob Creek® highball we were sipping on. When was the last time you had a patty melt? Can’t remember? Never? That’s what we thought. Well you should change that, but only if you’re letting Michael White cook it for you. This patty melt is incredibly tasty, especially when dipped in the homemade mustard sauce on the side. This is about as good as fried chicken gets, and fried chicken gets good. The skin is perfectly seasoned and crispy, and it's served with a side of cheddar biscuits and honey butter. You want all of those things in your life. A drink and a menu at the Butterfly. This is how it begins. Quite possibly the best patty melt we’ve ever had. Not that we’ve had a lot. But still, this thing is incredible. A Knob Creek® whiskey sour, looking delicious like a whiskey sour should. Them are what we call some fancy pork rinds. This rueben croquette is A-OK, according to Stang. It would’ve been silly of us to write a post about eating and drinking in New York City without including at least one classic New York restaurant. And Peter Luger is about as classic New York as a restaurant can get. This legendary Brooklyn steakhouse has been around since 1887, and aside from a few fresh coats of paint and an addition or two to accommodate more diners, we can’t imagine much has changed since then. Luger’s (as it’s known to most) is a traditional steak shop with a simple menu, but it’s important to know a few things going in. You’re obviously going to order a porterhouse steak, because that’s what they do and that’s why you’re here. It will be glorious and gigantic, and everything you’ve ever wanted from a piece of meat. But you are also going to want an order of their sliced tomatoes and onions, and you’re going to put lots of their famous steak sauce on top. Also, under no circumstances will you skip the extra thick “sizzling bacon” in the appetizer section. That would be a crime against your stomach, and also humanity as a whole. And if you’re really going for it on a weekday afternoon, get yourself a burger. Peter Luger enthusiasts know that they serve one of the best hamburgers in New York City until 3:45 PM every day. Treat this restaurant with respect and order right — then figure out the closest place where you can take a nap. You’re going to need one. It doesn’t sound like much, but when you pour some of that delicious Luger’s sauce on this beautiful plate of juicy tomatoes and onions, magical things happen. So simple, yet so delicious. Luger’s has been doing this dish since the days when “pork belly” was just called “bacon.” It’s a few thick slabs of the good stuff, and you absolutely need to order it. If you need some greens (you probably do), this classic wedge is the salad to order. A huge, delicious, porterhouse steak in a plate of its own juices: this is what a steak is supposed to be. Apply Luger’s famous sauce as needed and be glad you’re alive (for now). A simple burger — basically a beef patty with a slice of onion sitting atop a sesame seed bun. The quality of the meat is what sets this apart. Knob Creek® in a glass, no rocks. Sippin’ before steaks is a good idea. Bacon and bourbon = party time. The sauce, and the sauce. Post Office is one of our favorite undiscovered gems in all of New York. It’s a great neighborhood watering hole that offers a huge selection of whiskey, bourbon, and other brown liquor, and the food here is way, way better than what you’d expect to find in a tiny bar in South Williamsburg. We go to Post Office all the time just to eat some oysters, or pulled pork sandwiches, or one of the best steak tartares we’ve ever had. And more often than not, we’re grubbing with a bourbon drink at our side. Post Office also happens to be right around the corner for Peter Luger, so we stopped in for a second dinner and a few Knob Creek® drinks after our steak. Best idea ever. Who would have thought that the food in a bar can be this good? And since when did bars start serving deviled eggs? We love these, and order them every time. As we mentioned, the steak tartare at Post Office is one of our all-time favorites. Why? Because it’s spicy and the steak is tender and ground to the perfect consistency. The spicy kick goes nicely with the Knob Creek® rye. Another one of our all-time favorites, this pulled pork sandwich beats most of the ones you’ll find in BBQ joints around town. The pork is piled high and is all kinds of juicy, and that slaw on top makes for a nice crunch. Get some color in your life. This should probably be the last photo we take. Ever. If you know anything about New York’s dining scene, you know about Momofuku. What started as an insanely popular noodle bar in the East Village has now grown into a bona fide restaurant empire with outposts in places like Sydney and Toronto, serving everything from ramen to pork buns to fried chicken to cereal milk soft serve. Momofuku now also operates a cocktail bar called Booker & Dax, and in the spirit of everything else they do, they’re pushing boundaries and creating a whole new cocktail experience. Almost every drink employs the use of some kind of science, which is a subject we did very poorly in during school, so don’t ask us exactly what’s happening when that liquid nitrogen comes out. All we know is that the end result is glorious. Booker & Dax also serves excellent bar snacks, including the world-famous pork buns. And they feature Knob Creek®. How could we not hit this place? Yeah, this is how we roll sometimes. OK, not really, but Booker & Dax has caviar on the menu and we thought it might pair well with our Knob Creek® drinks. We were right. Booker & Dax’s caviar is served with accompaniments of brioche, yuzu crème fraiche, egg, and fennel. How civilized. We can’t say we’ve ever had deviled eggs quite like these before, and now we feel like we’ve been living life in the dark. These things are incredible. Also note the excellent touch of tobiko on top for a little bit of pop and salinity. Think charcuterie plate, but a bit less French. Our favorite is the Benton’s smoky mountain ham, which is a) smoky and b) delicious. And it comes with a side of “red eye gravy,” which is essentially mayonnaise with coffee in it. Any Southerners reading this? Y'all are probably familiar with that. One of the many things that made Momofuku famous, and you can have one here with a Knob Creek® Manhattan. Worse things could happen to you on a Friday evening. These beautiful scallops are served with avocado, black garlic, and red radish. It’s a visually pleasing plate, and it tastes even better than it looks. We’ve been eating a lot of deviled eggs. Almost too many. Almost. Caviar and Knob Creek® dreams. Thinking and eating. That’s what we do. Well, maybe not so much thinking. Maysville is a restaurant in Manhattan named for the Kentucky port town that was the birthplace of bourbon. 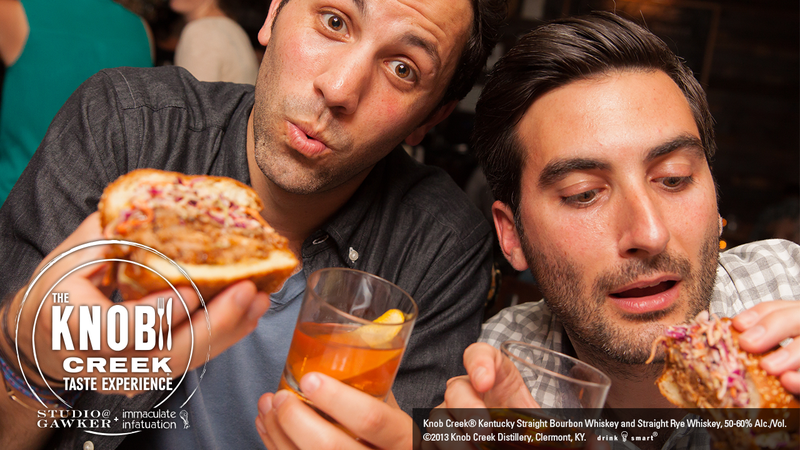 And if that’s not an appropriate place for The Knob Creek® Taste Experience, we don’t know what is. The menu of food here focuses on things that have been smoked and charred, which makes for nice flavor pairings with the extensive list of brown liquor that’s stocked behind the bar. We love Maysville because it’s an upscale restaurant with a laid-back vibe, and a great bar from which to eat and drink. There are lots of things on this Maysville menu that you’ll remember, but these oysters might be what sticks with you most. The hay imparts a good deal of smoky flavor to these guys, but they’re still delicate like you want them to be. We love crab, and we love toast, so what are the chances we weren’t gonna love this? A must-order. There are few things that benefit from the taste of smoke more than fish, and this trout is no exception. It’s fully in tact from head to tail, and all you have to do is peel back some of the fish’s skin to expose the perfectly cooked, incredibly delicious meat. Sip on some neat Knob Creek® with this, and you’ll be very happy. If you read any of our previous Knob Creek® Taste Experience posts, you might have noticed that we like to eat bone marrow from time to time (all the time). Maysville’s roasted bone marrow is a good one, especially thanks to the charred onion marmalade that comes with it. Hay roasted oysters, which are something you want to eat. Excuse me while I sample this thing. Squid ink spaghetti and a cocktail. Pictures of taking pictures of a fish. All photographs courtesy of Michael Mignano. Full? Never! Next up on the food tour: Andrew and Chris hit Philly. Until then, head to Immaculate Infatuation to check in with them, or go on a Knob Creek® Tasting Experience yourself. Knob Creek® is a registered trademark of Jim Beam Brands Co. and is used with permission.